jensen and jared meet puppy'z tattoo. so, day one and i go to get my first photo op. they call out people who have tickets for jensen and misha. i figured most people would be going to jensen, so i'd probably get to meet misha first. WRONG!!! the guy collecting tickets asks "who do you have tickets for?" to which i reply "both!" he says "okay, you go straight into the line for jensen." BWUH??? my first pic with someone famous will be jensen??? WOO HOO!!!!! hehehe, i would have done the happy dance, but it was a bit too squooshy for that. i come round the corner and OMG!!! there sits jensen!!!! *heart kicks into overdrive* awww, he looked so damn cute in a grey vest over a nice white shirt!!! so, a quick prayer to the powers that be not to sound like a total moron and i walk towards him with a smile and a cheerful "hi jensen!" a big friendly smile from him and i can't help myself!!! "i thought you might like to see this," says the puppy, pulling my tshirt up far enough to show him my tattoo of him and jared on my right hip. he responded with a rather shocked and very loud "OH MY GOD!!!!!" LMAO, i thought the poor boy was gunna fall off his chair!!! *sniggers* hell, i would have happily helped him up!!! 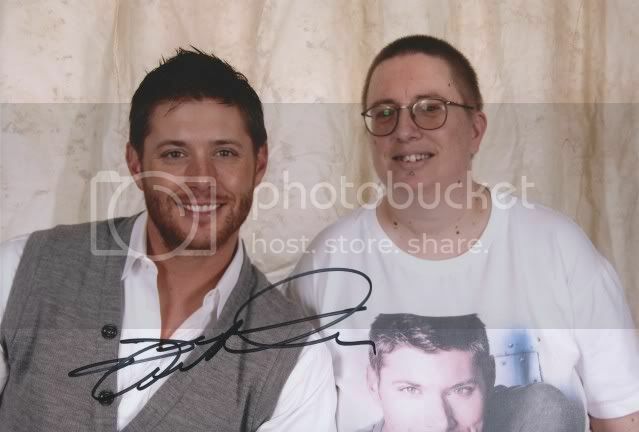 a quick snap from the photographer and jensen asks "can i see it again?" well duh!!! of course he can see it again!!! another flash of the tatt and he is all big smiles and the photographer says she needs to do another shot. awesome!!! i bet i got the biggest, happiest smile of anyone at the con!!! 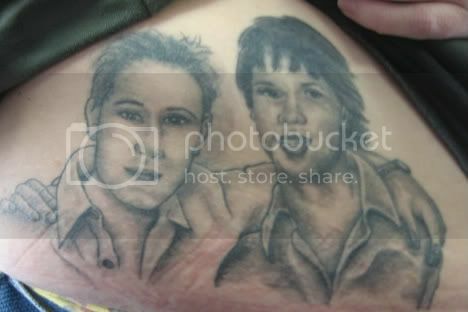 i also managed to show him the one of just him, which is on my right breast. i then go round, expecting to have to join the back of the queue to get misha's pic, but some nice girls up the front insisted on me going first. :-D misha gets to stand up to have his picture taken, which is fine, since puppy is not really short. i step forward smiling and say hi, misha, then my god!!! misha's arm is round me!!! a quick snap and it's over, except misha cheekily asks "who's that funny looking guy on your tshirt?" LMAO, as anyone who knows me even a little would know, it's jensen, of course! mkay, he wants to be cheeky? so i turn round and say "well, it's probably the same guy as here!" flashing him my tattoo of both boys. LMAO, would you believe it??? the exact same reaction as jensen! "OH MY GOD!!!!!" the signature and misha's message were actually done on day two, after i won the auction for jensen's tshirt. so right about now, i'm a happy little puppy, but i still gotta show jared, yet. back to my seat for a little bit, then they ask for anyone with sandwich pic tickets!!! WOO HOO!!! that would be me!!! LMAO, the guy collecting the tickets is like "you again???" and i said "of course, but i'm not finished yet!" so, into the queue and i'm going to see jared. i haven't decided whether to show him the tattoo now or wait for my photo with him. LMAO, then i come around the corner and jensen sees me. :-D OMG!!! he remembers me!!! he'z all excited and telling me "show jared your tattoo!!!" and yet again "OH MY GOD!!!!!!" says jared. naughty jensen insists "show him both!!!" so i flash my jensen one, too. awwwww, jared is so cute when he pouts. "but.....you only have one of me and you have two of jensen.." says jared. i sort of wave towards my jensen tshirt and told him "sorry, but, um, yeah!" as you can see, happy jensen, not quite so happy jared. what can i say? i'm definitely a jensen girl, but i still love jared, too!!! not long after, it's time for my photo with jared. so, back into the line and the guy taking tickets knows me now. :-) LMAO, jared seems to have overcome his disappointment at me having twice as many tatts of jensen, well, mkay, maybe not quite over it yet. but i still get a friendly hi and he recognises me from before. I still laugh at their reactions-and you told about this days ago! LOL!!! Poor Jared-heheheee! Is this the blog you meant when you emailed me? If so I found it-duh! I was thinking you made a new lj or something! I need more coffee? *Snickers* You guys look great!!! awwww, i did manage not to LOL at jared'z reaction, poor boy. he'z so damn cute, though, when he poutz!!! yes, this iz the one i meant. :-P woman, wot have you been sniffing??? glue??? or woz it coke??? i told you that'z bad!!! the bubblez will make you sneeze every time!!! I can just imagine! *G* Poor Jared-lol!!! I am not sure? My pc is all wonky today too-I went to answer this and everything disappeared-I had to reboot to find it! WTF? I am not amused! OY. LMAO, i really thought he woz gunna fall off his chair!!! :-D awwwwww, i know!!! i blame jensen!!! he told me to show jared both tattooz!!! awesome!!! i'm considering getting another two, one at each side and having small ringz put through them. i just gotta work out whether to get both done at once or one at a time. I suppose it depends if you get a lot of swelling with piercings, if not then getting both at the same time is fine (I've considered one side piercing, but am still debating over it). Jared doesn't look to happy in our pictures.. Lol. awwww, poor jared!!!! i don't think i saw anyone wearing a jared tshirt the whole time, then there'z me with a different jensen one for both dayz!!! although he did read the second one out loud then giggled. :-) but seriously, would i have jared tattooed on my body if i din't luv him too??? i don't know about anyone else, but i have no intention of going through that much pain for someone i just 'kinda' like!!! Lol By the way i meant your not our.. It was him && Jensen..
Just read all your posts for AHBLCon and OMG, awesome! :D I love that you flashed Jensen, HAHAHA. Wow. You should totally take a pic of your tattoos though - I want to seeeee! this is it not long after it had healed up. i have had both autographz added since this woz taken, but haven't had pix taken yet, as my tattooist iz off work with a nasty injury. mkay, will just have to post a pic here then, i guess!! !